“The longest journey begins with a single step ” – that is the inspiring quote I am using as the opening epigraph for my book of Bound Feet Blues. It is apt for the topic of bound feet and in particular the pain of walking in bound feet – but also encompasses any endeavour we may try. 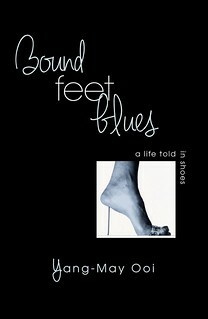 One of the themes of my show Bound Feet Blues is the power of being able to walk on your own two feet. This theme is a very personal one for me as I love being able to stride about. In my daily life, I value being able to choose where I go and taking in the busy urban landscape of London at a walking pace. I also love long walks in the countryside and in particular, walking on long distance trails. With my partner and our friends, over the last three years, I have walked almost 300 miles along some of Britain’s most beautiful long distance paths. So, as you can imagine, I am an avid fan of Cheryl Strayed‘s hiking memoir Wild – about her 1,000 mile transformational hike along the Pacific Crest Trail in America. And last weekend, we headed off to the movies to see the film version starring Reese Witherspoon. See the trailer below. The movie is a terrific adaptation of the book, bringing out the internal journey as much as the external journey. The story is as much about a an intense mother-daughter relationship as it is about Cheryl’s discovery of who she is through the solo challenge of the long distance hike – in fact, the two themes are inextricably linked. This thread means a lot to me as Bound Feet Blues is also about intense mother-daughter relationships – and self-discovery is portrayed through two life transforming hikes! Where do we come from? WHO do we come from? Our family history can give us our identity, shape how we view ourselves and our place in the world. I am so grateful to my 13 year old self. Because in 1976, I asked my Grandpa to tell me about our family history and I recorded it on a tape recorder. In that recording, he tells the story of how his grand-father, my great-great grandfather, came to Malaya (now Malaysia) from China. He died the following year. It is the only family recording we have of Grandpa’s voice and it is the official account of the story of our family (on my mother’s side). In addition to this recording I have recordings of my Grandma and also reams of notes of stories and conversations with other aged relations, collected over time. Now I am 51+ – about the same age as my Grandpa was in the photo above. 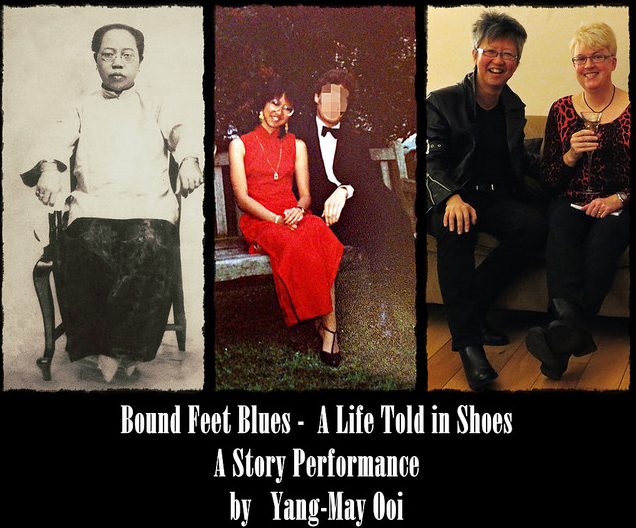 My fascination with my family heritage has led me to create Bound Feet Blues, the story performance. I am also writing a book telling the Stories Behind the Story of the show – which will include the story about the Bandit Boy that Grandpa refers to in the recording. Not only has my interest in my family history sparked my creativity, it has also given me a sense of who I am and my place in the world. Audiences for Bound Feet Blues seem fascinated by the family stories portrayed in the show – and I think this is as much because it prompts them to reflect on their own family and their relationship with their parents and grandparents and great-grandparents as it is to do with any particular interest in the specifics of my family. Many people have said to me that they wish they knew more about their own family history. Bound Feet Blues explores female beauty in the context of Ancient China and the practice of footbinding that was meant to make a woman more beautiful. My work on this project has led me to reflect on modern concepts of beauty in the modern West. Now, I have just seen this article on the BBC website by historian Bethany Hughes looking at the beauty in the world of the Ancient Greeks – and it points to a rather different view of beauty from what we are used to. This point of view contrasts with most notions of beauty which ellide goodness of character with good looks. In Ancient China, for example, an Exemplary Woman was one who was obedient and dutiful – and who was also beautiful, where her beauty was entirely defined by the tiny size of her feet. In modern times, heroines in movies and books tend to be beautiful, too, rather than plain or ugly unless their plainness is part of the plot device/ reason for the story. Bound Feet Blues – the Book continues apace. I am now 42,000+ words in as the fourth chapter builds up its word count. This chapter is entitled “Lotus Feet” and expands on the scenes in the show that dramatize the history of footbinding and the painful process of a mother binding her daughter’s feet. I can finally share a lot of the research I did for the show but which could not be squeezed into the 25 page script that makes up the one hour long show. It has been very satisfying writing away over the last few weeks, gathering it all together in a coherent way so that those interested in the themes of the show have the chance to learn more about the details and history of this brutal yet macabrely alluring practice. In 1644, the new emperor of China and the progenitor of the Ming dynasty, a Manchurian who had taken power by violence and invasion, banned footbinding. It was part of a set of laws that dictated what the Chinese people wore, mandating queues for men and the Manchu-style tunic with its high Mandarin collar for both sexes. While those latter laws came to be obeyed and over the centuries even evolved into symbols of Chinese identity, footbinding continued for almost four hundred more years. It is a testament to the will and defiance of generations of women. Manchu women did not have bound feet. But the allure of the tiny bound foot was so powerful that over time, even they wanted to have dainty little feet. I believe that some Manchu women bound their feet and their daughter’s feet. Others wore a version of high heels that gave the impression of tiny feet beneath their long gowns. A detail of one of the panels is below – notice the woman’s red shoes and her disproportionately small feet. See my previous blog posts about the exhibition and other bound feet artefacts you can see there.